ABCD SW supports one-to-one teaching, so the child and the tutor (or parent, teacher, etc.) 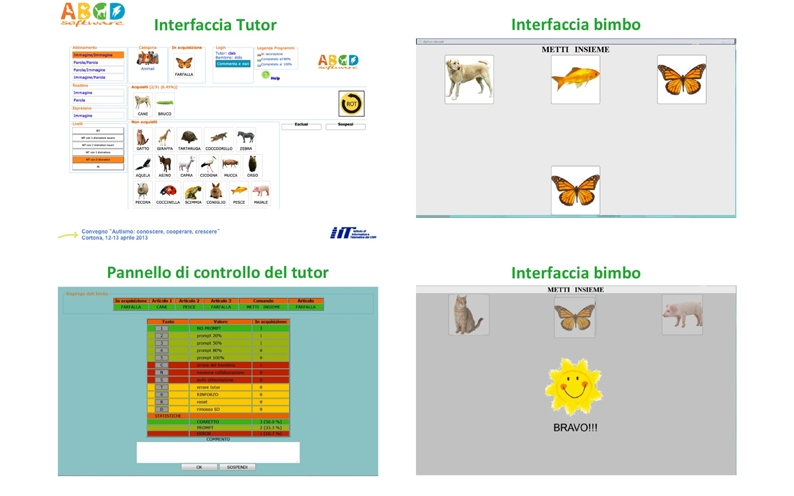 must work together: the tutor sets the exercise with its interface (fig.1), the child Performs on a tablet / touch screen device (Fig. 2 and Fig. 3). The tutor evaluates the test by pressing a key (among those shown in Figure 4) to indicate whether the exercise was performed independently or with help or if there were any problems. Only after evaluation, the new exercise appears on the child’s device. All interactions with the software are recorded to check the didactic performance over time.